The setting is an insular Italian-American community on the Gulf Coast in 1950. 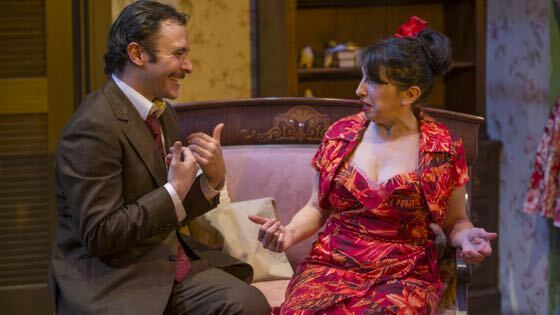 Tennessee Williams’ play, “The Rose Tattoo,” is a tragicomic tale of love lost and love gained. Its Sicilian characters are superstitious and passionate in their joy and in their grief. The play is an emotional roller-coaster and suggests to me that our techno-laden lives might be healthier if we let in more human spirit. Greg Vinkler directs this Shattered Globe production with clear fondness for the quirks of the Sicilian community. The cast is excellent all around with outstanding performances from the leads: Eileen Niccolai as Serafina Delle Rose, the grieving widow; Nic Grelli as Alvaro Mangiacavallo, the earthy visitor who lifts her veil of grief; and Daniela Colucci as Rosa, Serafina’s daughter. Other cast members contributing to the community cavalcade are housewives, children and the Strega (a witch played by Darla Harper), to whom Serafina shouts “Malocchio! Malocchio!” (evil eye). When 12-year-old Rosa looks at the Strega, Serafina instructs her to go in the house, wash her face with salt water, and throw the salt water away. Rosario, who has been hauling more than bananas in his truck, is killed in a fiery crash. Serafina learns of his death and has a miscarriage. Three years later, Serafina’s hair is askew, she’s dressed in a ragged pink slip, and spends her time grieving and praying to a statue of Mary over her husband’s ashes. Neighbor women pester her to finish the dresses she’s making for their daughters’ high school graduation. Rosa also will graduate, even though Serafina is trying to keep her effervescent daughter from growing up too fast. The Shattered Globe ensemble does a superb job with all the accoutrements to stage “The Rose Tattoo.” Sarah Ross’ set design and Charles Cooper’s lighting enable both interior and exterior scenes. Susan Gosdick has coached the actors effectively on their Italian accents. Costumes designed by Sarah Jo White are colorful and dramatic. The dresses worn by Serafina and 15-year-old Rosa are especially reminiscent of 1950s styles. Tennessee Williams had traveled to Sicily and had learned even more about the culture from his companion Frank Merlo, whose parents were from Ribera. Williams’ biographer, John Lahr, (“Tennessee Williams: Mad Pilgrimage of the Flesh,” writes about how Merlo “regaled Williams with tales of his parents … and their large, noisy bumptious first-generation Sicilian-American family.” “The Rose Tattoo” opened first in Chicago in December 1950 and on Broadway in February 1951. A film version directed by Daniel Mann from Williams’’ screenplay was released in 1955. This review was previously published in gapersblock.com/ac/.